The first three(ish) pages of some of Josh Barkey's finished(ish) scripts -- both produced and not. A pregnant teenage redneck hacks into the NSA, triggering global catastrophe. 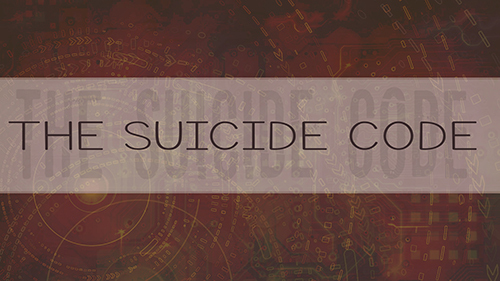 THE SUICIDE CODE is a feature-length sci-fi action/adventure screenplay by Josh Barkey. It was a quarterfinalist in the 2016 Nicholl, Script Pipeline, and Page contests. Click THIS LINK to view a T.S.G. promotional package, which includes character breakdowns and a synopsis of the story. It’s a lazy, sun-baked summer day. Tall grass whispers all around, as we rise to see the newly-planted cornfields beyond and hear... is that a bee? Buzzing in across a checkerboard panorama of fields is a DIRT-BIKE, coming fast. The helmeted RIDER zips closer, between plowed rows. The dirt bike WHINES to the edge of the next field over, dips down into a shrub-lined windrow-declivity, and oh-my-gawud, this Rider is INSANE. The bike SAILS up and out. A HUGE jump, as we WHIP around to see a lone, clapboard FARMHOUSE, surrounded by fresh-planted fields and shadowed over by an old, bent oak. The Rider lands hard in the field and almost bails, but catches balance and rips up one last corn row and onto the dirt road, to SKID to a stop in front of the farmhouse. The Rider steps off the bike. Reaches up to take off the helmet and... It’s a teenage GIRL! JO BECHDEL wears jeans, a t-shirt, and loose-fitting flannel. Maybe she’s pretty, maybe she’s not. Who cares? She’s an animal on that bike, and she’s got other skills we’ll see soon enough. Jo steps into a light-filled, homey entryway. Faded-but-clean lace curtains, worn-wood furniture, and turn-of-the-(previous)-century construction. By the door is a PHOTO OF A MAN in fatigues, next to a triangle-folded American flag in a glass case. Jo’s mom (ESTHER - 40s) calls out. But Jo’s already running upstairs, to her room. Jo strides across the spare, sun-filled space to a possibly-ironic KITTEN CALENDAR, and taps the days one-by-one with her index finger, as she counts under her breath. Jo stares back at the calendar and then... reaches down the front of her jeans. She pulls her hand back out - stares HARD at her index finger. Jo STORMS back over to the calendar. SLAPS her hand HARD against the wall. Jo’s head SNAPS sideways, to see ESTHER BECHDEL standing in the doorway in a flowered, floury apron: the quintessential southern mother, looking vaguely suspicious. Jo’s not waiting around to find out. She grabs her canvas LAPTOP BAG off her dresser. It’s covered with all sorts of anti-government, savethewhales-type patches. That Griffin boy came by again. Jo ignores her mom, as only a teenage girl can. Jo pushes past her mom, out the door. Jo reaches back inside the door - flips the light-switch down. Nothing happens, because the power’s out (and besides, that’s not what her mom meant). It went out just before you got here. But Jo’s two-stepping down the stairs. Esther follows Jo downstairs, but at the familiar sound of the dirt-bike she stops, by the portrait of her late husband. ...the weirdest little town in the state of South Carolina. Grew up paddling a dugout around the Amazon, fishing for piranhas. Then paid for an English degree by hand-planting hundreds of thousands of baby trees in Canadian dirt. Now living in a shed in North Carolina, making word-arrangements.